Have you ever been paging through an article and stumble across a quote that just stops you in your tracks? Here’s one attributed to Adlai Stevenson that recently caught my eye. Stevenson was talking about political campaigns, but I think the idea can be applied to many situations. He said that the challenge was to not just win, but to win “without proving that you are unworthy of winning.” I think that sentiment speaks to integrity, grace, and fair-mindedness. Recently some of my colleagues and I were at a retreat, sharing information about helping facilitators manage decision making and conflict in groups. I realized that Stevenson’s sentiment can also be applied to helping groups make decisions. 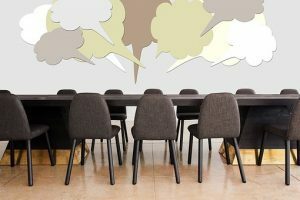 One of the trickiest situations for a facilitator can be encountering and effectively handling disagreements among group participants. Making decisions in groups is difficult and often messy, but helping a group make complex decisions is one of the most important tasks of a facilitator. The lively discussion that is part of the group decision making process, however, often involves people who feel passionately about their ideas, and sometimes that passion can escalate to a discourse that is unhelpful at best, and can often be damaging to the group or individuals involved. The facilitator’s job is to create an environment where sharing a diversity of ideas is viewed as an important part of the process to create stronger, more sustainable solutions. In Facilitation at a Glance, a handy field guide to facilitation, the author, Ingrid Bens, highlights two different kinds of discussions that can occur among group members. Bens describes productive disagreements as debates. In this type of conversation, individuals are open to the ideas of others – even when they may be different from their own. Everyone strives to understand the views and perspectives of the other group members, and remains objective and focused on the facts. Arguments, on the other hand, are a type of discussion that is often unproductive, and may damage relationships and group momentum. According to Bens, in an argument, people assume they’re right and are often not really listening to the ideas of others. The discourse often results in personal attacks or blaming. 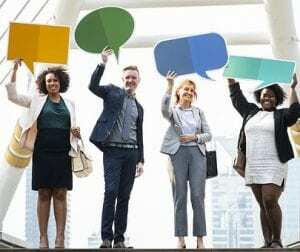 slow down the discussion by encouraging individuals to paraphrase what they are hearing each other say and allowing only one person to speak at a time. Creating shared agreements can help groups reach the finish line with their integrity and friendships intact. 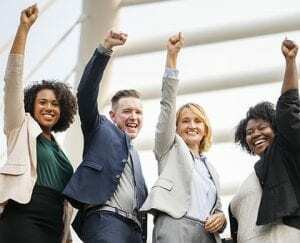 When it comes to group decision making, debates that lead to compromise and collaboration are essential to helping group members be worthy of their win. 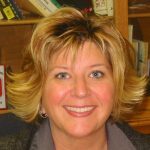 Becky Nesbitt is an Assistant Professor and Extension Educator in Community Development with OSU Extension. For more information about Becky and her educational efforts, visit here. Why is it so difficult to make good decisions in groups? We know that the benefits of group decision-making are substantial: better thinking, more viable and sustainable action plans, a stronger sense of ownership for achieving a desired outcome. In fact, when done properly, group decision-making may be our best hope for solving difficult, complex issues. Unfortunately, group discussions often result in decisions that lack imagination, thoughtful consideration, or inclusiveness. To move beyond these typical issues, Kaner suggests that groups employ a facilitator, a neutral third party who can help the group members do their best thinking. Good facilitators, he explains, “strengthen the effectiveness of the group of people who are there to get work done.” The facilitator “helps, serves, teaches, and guides,” while the group members themselves “resolve, decide, produce and act.” Good facilitators understand group dynamics, and value the process of group decision-making. They use their skills to help group members tap into their own collective wisdom. Are you interested in strengthening your facilitation skills? Contact Becky Nesbitt at nesbitt.21@osu.edu to learn more about OSU Extension’s facilitation training. For more info, visit the CD webpage. Becky Nesbitt is an Assistant Professor and Extension Educator in Community Development with OSU Extension. It is late June, 1998. Warm moist air has collided with cool air to develop a frontal boundary creating thunderstorms covering much of Southeast Ohio. The frontal boundary system stalls and its resulting storms produce a foot or more of rain over four days that floods the banks of Duck Creek, a 30-mile long tributary that flows through Noble and Washington Counties. 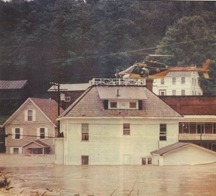 Families are forced to wait on rooftops for rescue by helicopter, waters reach the tops of utility poles, and nearly all the homes in one small town are destroyed. All told, this localized flooding caused five deaths and an estimated $20 million in property damage. As a result of this devastation, local officials, agencies and residents began an initiative to establish a flood warning system for Duck Creek. 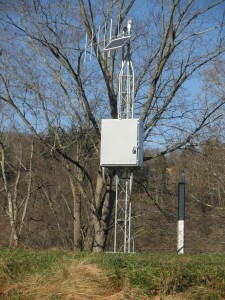 After several years of research and evaluation, a system consisting of various stream and rain gauges, computer monitoring equipment, transmitters and associated enclosures was designed. In 2012, installation was complete and the system became operational. This system provides real-time data for the National Weather Service and can be accessed via USGS website. This information aids emergency management personnel in making emergency preparedness decisions. The $376,000 project is expected to produce a benefit in avoided property damage of $131,260 annually over 50 years; a total impact of over $6.5 million. Ohio State University Extension coordinated this collaborative project that included U.S. Army Corps of Engineers, United States Geological Survey, Muskingum Watershed Conservancy District, state and county Emergency Management Agencies, and Noble and Washington Counties. This decade-long project illustrates the role Extension can plays in strengthening communities and the environment.